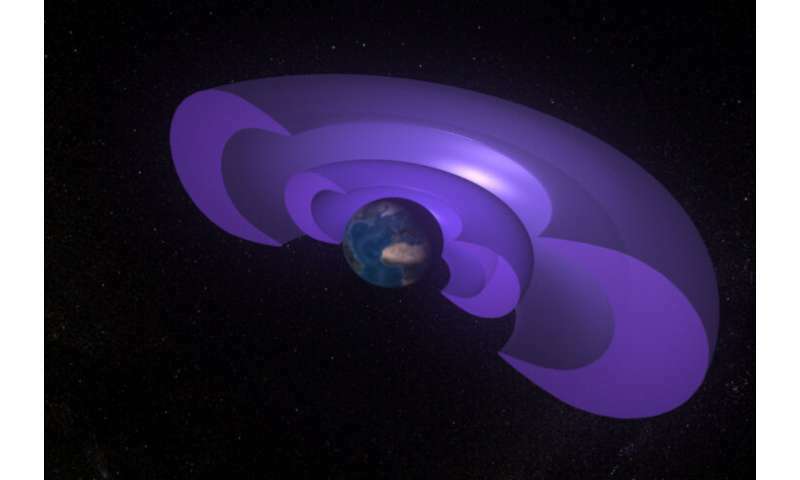 A new, first-of-its-kind space weather model reliably predicts space storms of high-energy particles that are harmful to many satellites and spacecraft orbiting in the Earth's outer radiation belt. A paper recently published in the journal Space Weather details how the model can accurately give a one-day warning prior to a space storm of ultra-high-speed electrons, often referred to as "killer" electrons because of the damage they can do to spacecraft such as navigation, communications, and weather monitoring satellites. This is the first time researchers have successfully predicted those killer electrons across the whole outer belt region. At the Earth's equator, the outer radiation belt—also called the outer Van Allen belt—begins approximately 8,000 miles above the Earth and ends beyond 30,000 miles. High-speed high-energy electrons inside this belt are known for their high variability, especially during solar storms, when new particles from the sun enter the Earth's space environment—making them extremely difficult to predict. This will start to get interesting when they can predict solar storms. These hazards might finally get into the heads of people big on space travel and colonizing the Moon and Mars, etc. Accurate predictions of CMEs and SPEs (and their direction) might come in handy if you are well outside the VA belts. Does anyone know if the Webb Telescope, if it ever gets launched, has any protection from such solar storms, being out at the Lagrange point (L2)? Would be a real shame if it got wasted. In fact, it was trouble with the solar shield that has largely delayed the mission.